I'm not really sure where the past two weeks went to, but WOOOSH! 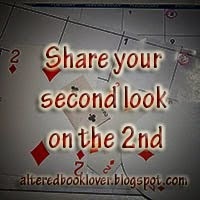 Here it is Tuesday again and time to catch up with all The T-Gang at Elizabeth's blog. The first week I was absent was due to two sick granddaughters, about a third of both of their classes were absent with the flu that week. Then last week a dear friend of mine ended up in the hospital with pneumonia and we were all rallying around her. 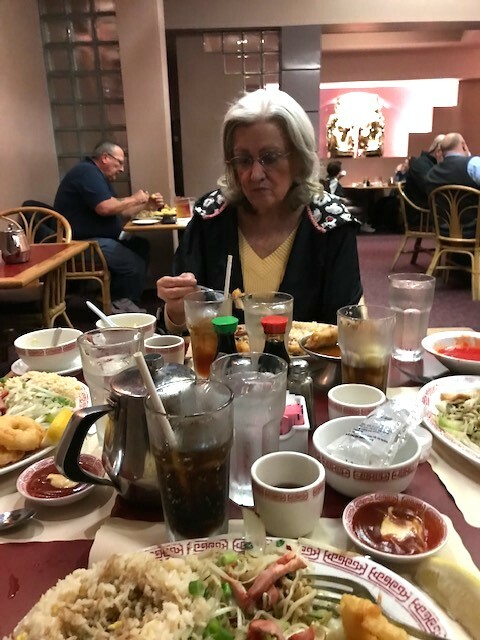 Even though we had a very sick friend in the hospital, we did take time to celebrate Lea's 75th birthday at Bill Lee's Chinese restaurant. One of our favorite lunch spots.......lunch specials are only $10.00 and none of us can finish them, so there are always take-out boxes for all of us. 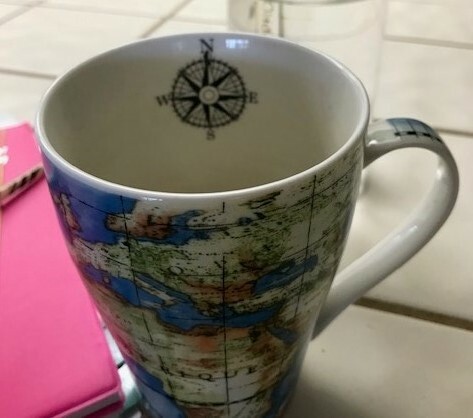 Even a compass inside to keep me on the straight and narrow! LOL! I took this photo of Hannah when she was about 5, we were at the beach and she was just walking along the edge water listening to the music inside her. I just happened to notice and grabbed my camera. It has always been one of my favorite photos and always wanted to paint it.....but always held back. I had already painted and collage this canvas, that I had painted black, to hide the really bad tulips (LOL) So this morning I decided to give the painting a try.....this is where I am at right now. It will eventually say "I Hope You Dance"
I'm sorry to hear of illnesses in your friends/family circle and trust all are well or on the mend now. 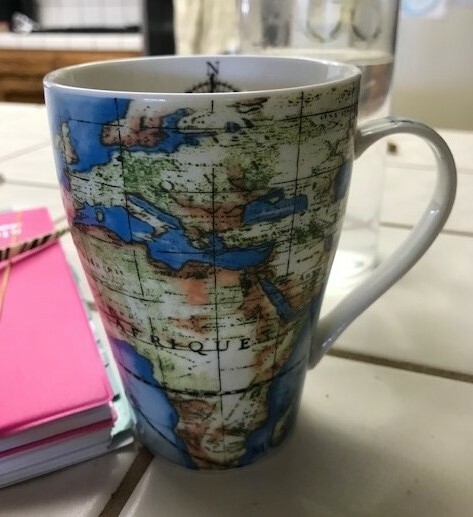 That world mug is a wonderful thing! I'd always pick it for my morning cuppa if I had such a thing. 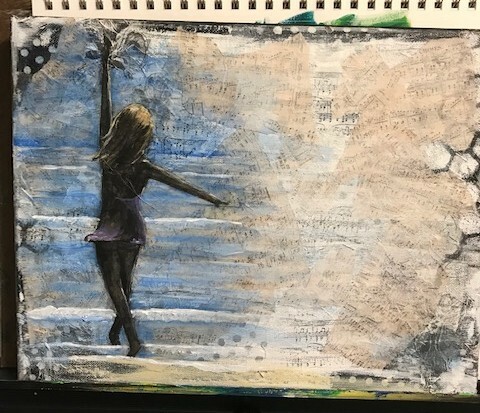 The closest thing to travel in my world right now ;) Your painting is _good_ and shows the life of the dance in your photo. You have talent for capturing the movement :) Happy T Tuesday! Wow your painting looks beautiful, I hope you will show to us with the words you want to add. It looks a delicious Chinese meal you had and I hope everyone you mentioned will be feeling better soon. Happy T day wishes, your new cup looks great. wow- only$10 for that lunch-awesome! How precious that photo of Hannah is and I can see why it is a very favorite. What beautiful lyrics written for that song too.Love what you have done with the painting so far! looks like I may have done something similar as far as painting and collage go. Will post it next week. Hope everyone feels better real soon. Happy T day! The painting is stunning just as it is! Such a happy feeling piece. I do like your new cup. Hope all those you love are getting well by now. For some reason, I thought I had been here. So sorry to read about your friend with pneumonia. I was down and out for DAYS with it, too. I hope she is better soon. I'm liking that painting already. I know it will be stunning once you have finished it. Your lunch looks wonderful and I always LOVE Chinese food, too. Thanks for sharing your art and your Chinese food and all those drinks with us for T this Tuesday. LOVED the mug, too. i can understand you love this photo and you will make a wonderful painting of it, already to see... all the best for for the health of your friend! I'm sorry about all of the illnesses. The food looks delicious and I love that world mug you have. Your painting of her on the beach looks great. Happy T-Day! I'm sorry to hear so many people are poorly. I hope you are well and that the others will get better soon. Wow, your drawing of Hannah is awesome. The Chinese food looks really yummy. I love Chinese food, but I don't always trust the restaurants. And yes, your mug is a firm favorite. It makes you want to travel. What tough times, Krisha. I'm happy to hear everyone is better ... and that you were able to take time out for a birthday celebration at a Chinese restaurant. I love good Chinese food and Bill Lee's food look delicious. Love your world cup. It reminds me of T-lady Kathy's Yellowstone cup. Even though it's not finished yet, I adore your Hannah dancing page. I did dance today (grin). Your mug is wonderful! I love that map. Wow! What a beautiful painting/collage. Is looks like such a serene scene. You have captured the photograph beautifully. Wow, your painting is wonderful. I love it as it is. Glad you enjoyed a meal out with friends - reminds me of the times I spent with my friend in America (she passed last May) - we had a favourite Chinese restaurant we used to go to ever such a lot whilst over there. In fact we had just the three of us or with another friend tagging along up to the hole family of about 14. Happy Days - thanks for the memory flooding back. Nice to see you on Bloglovin' - long time since we corresponded but I still think of you. Your canvas is absolutelly Gorgeous Krisha !! Love the lovely figure of your granddaughter, the layers, and fabulous colours. It´s a great Artwork ! I hope your family and friend are now much better. This world in a cup is so cute!! and the celebration may have been beautiful. 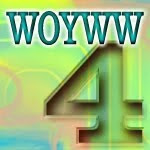 I want to thank you very much for your visit and your so kind comment at my blog, very appreciated. Even if you don't normally visit me daily, I could use the support right now. Thank you and Happy Easter.